*Please note we received our Dimplex Fireplace for review purposes. As always our commitment to you, our valued readers, is to share our honest opinion(s). AFTER - Nothing to even say! If you’ve followed any of home content, chances are pretty high that you’ve heard about our longstanding frustration with our living room. Our main issues are the small size, lack of focal point and zero coziness factor. 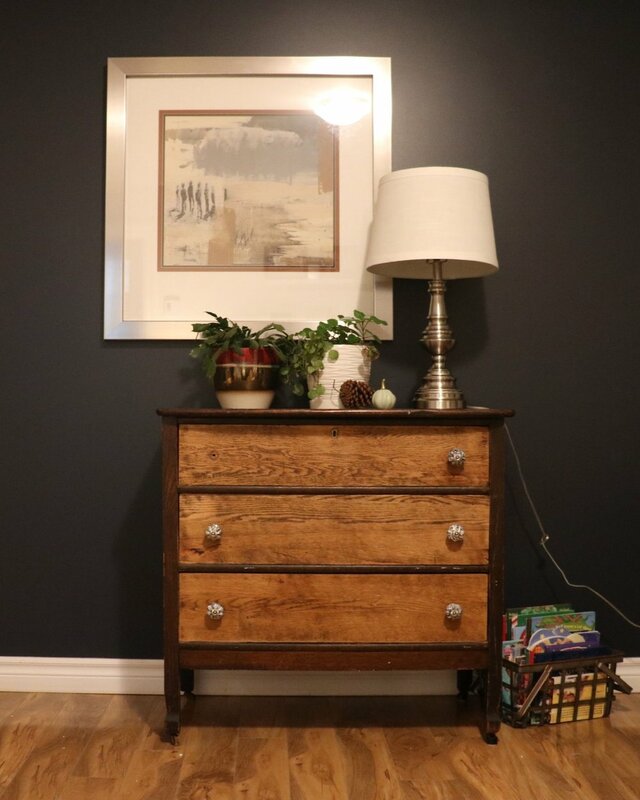 We have tried every furniture configuration possible, have swapped more pieces in and out of that room than I can even name, redecorated and painted all with no success. Our living room remained, blah. Size: Our living room is definitely on the smaller side and we didn’t want the fireplace to overtake the space. The Jean mantle is 125.4cm which has worked out to be the perfect width for either wall of that room. Look: Our aesthetic is simplistic and subtle; the Jean mantle provides the perfectly complement to this. The crisp lines, bold white colour and classic detailing has tied in wonderfully to our existing decor. Our Dimplex arrived in two packages; the firebox and the mantle. Neither required a lot of work to assemble and the directions were very straight forward and easy to follow. Putting everything together took under an hour! Focal point: The fireplace immediately created a point of focus in our living room which had previously been lacking. It has provided anchoring and a central point from which furniture can be arranged. 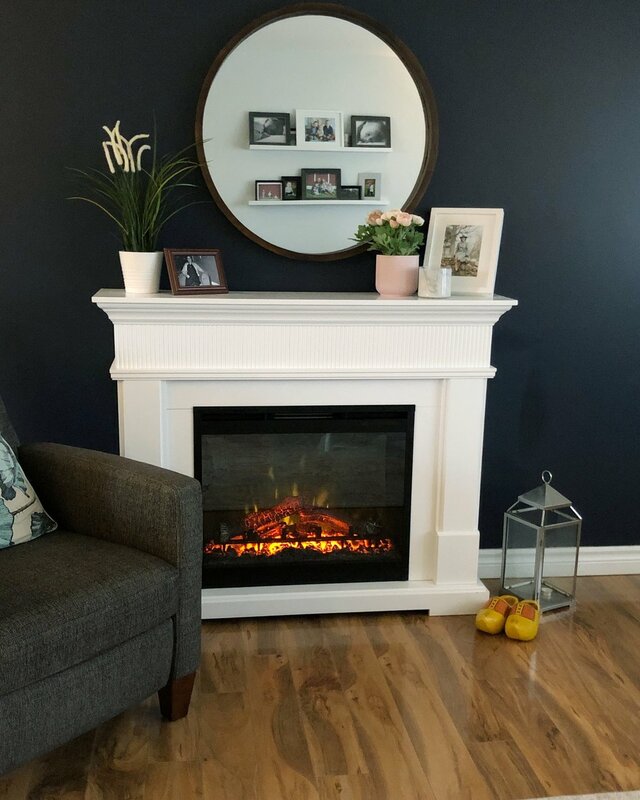 Ambiance: Not only is our Dimplex Jean Mantle gorgeous to look at, but the firebox provides such a beautiful glow that we have it on pretty much non-stop. We especially enjoyed this during the holidays! Warmth: Okay, so one thing I was not anticipating was the heat that our fireplace provides! I knew that it offered a bit of warmth, but I grossly underestimated just how much! As we’re presently in winter, at almost any given time you can find at least one of us standing in front of the fireplace getting toasty! It comfortably heats up the entire room. Decor options: The mantle! I love having a mantle to seasonally decorate. It’s such an easy way to style a room without too much effort. Construction: We are impressed with the solid build of both the mantle and firebox. Ease of use: The firebox comes with a remote which is really convenient. It also has a full control panel discretely located on the front. Portability: While we love the location of where we have our fireplace and are unlikely to move it, it’s still nice to know that if we did want to change things up - we can! Not having a permanent fireplace allows us to be flexible in the styling of our living room. Honestly, not a single one. To sum up everything, the only regret I have about our new Dimplex is truly that we didn’t get one sooner. It has completely redefined our living room; making it both more aesthetically pleasing but also a room in which we now spend the most amount of time together!